By Ian Aldous: He certainly didn’t do it the easy way. Daniel Roman (24-2-1) did something that few fighters from the West do – travel to Japan and claim a world championship. Not only that, but he travelled back there to defend it. 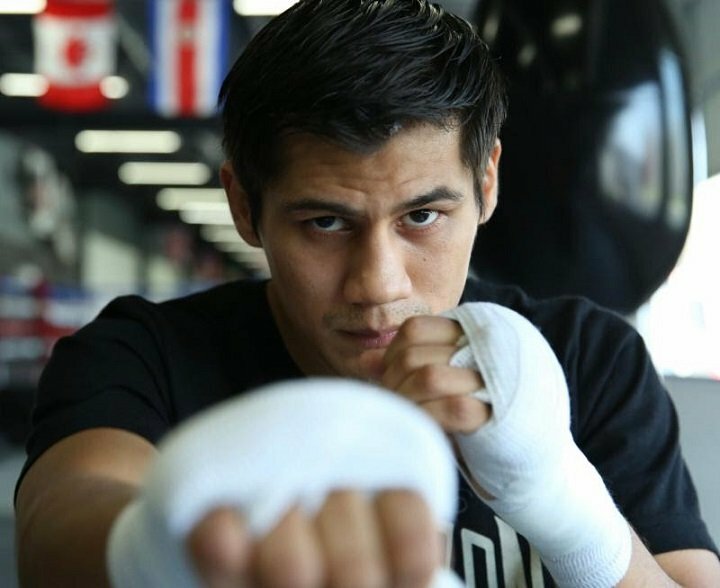 Now he’s back fighting in the U.S when he defends his WBA super-bantamweight world title against Moises Flores (25-0) on Saturday night at the Ford Center at The Star, Frisco, Texas, live on Showtime. Last week, he took some time to talk with me over the phone about his time in Japan and Saturday’s fight. IA: You won your world title in very impressive fashion against Shun Kubo over in Japan. You negated his reach and height advantages with nasty uppercuts, hooks and straight-rights. Did the fight pan out how you expected it to? DR: Yes, yes. Our plan was to dominate him and do my fight – don’t let him do his fight by using his reach. So, I had to be on top of him and not leave it in the hands of the judges. IA: You barely threw a jab all night! It must be so much more tiring to throw almost 100% power shots as opposed to sitting behind your jab? DR: Yes (laughs). Well, he was expecting me to use the jab, so he tried to counter me and I tried to avoid that. IA: You had him hurt at the end of the sixth, down in the seventh and eighth, before he was stopped on his feet in the ninth and you were crowned WBA world champion. Rewind back to 2013 when you lost an eight-rounder to Juan Reyes, after that fight, could you ever have dreamed you’d be in that position as a world champion? DR: No (laughs). Because after losing a fight, people start losing interest in you, like promoters. You start having a little bit more trouble trying to get back on top again. But, I told myself, ‘I’m going to waste no time and this is going to be the last time I lose, I’ll train even harder’. Thank God after that – it’s going great. IA: Five months later you went back to Japan to defend your title against Ryo Matsumoto. You had to go the distance, but it was another dominant display. Did you expect Matsumoto to be a little more competitive than he was? DR: Yeah, because he was 21-1 with 19 knockouts and I knew I had to watch out for this guy’s power, because in the videos I saw – he was knocking everybody out. I had to stay focused and do my fight and not let him use his reach. Matsumoto was taller than me and he had the reach (advantage) too. I tried not to leave it in the hands of the judges too because you hear all this (negative) stuff, but the people were fair and they treated me nice. They like boxing over there too, they love it. IA: It’s quite rare for North American and European fighters to travel to Japan and win, let alone twice! How did you find the whole experience? DR: It’s pretty hard (laughs). You give a lot of advantage (away). You got to go a few days ahead of time, so you get adjusted to the time (difference). From California, it’s sixteen hours difference, sixteen ahead from us. Then the weather, it was really cold. I was going outside to go and do my running and I was starting to get sick (laughs)! So, we decided to run on the treadmill in the hotel we were staying at. Other than that, the people out there are great. They treated me nice, they’re good people. You give a lot of advantage (away), it’s not like when you fight at home. IA: And what about the language barriers, that must make things really difficult? DR: Oh, yeah (laughs), it was. It was difficult because you try to communicate and you learn a (little bit) of the language, a few words. It was hard to communicate. IA: After your two bouts in Japan, is June 16th the chance to showcase yourself on Showtime as a bona-fide world champion returning home to fight on U.S soil? DR: Yes, I feel it like that. I feel like I’m back home and I’ll give people that haven’t had the chance to see me here in the States (what they want), they’ll be able to see me fighting on Showtime. Errol Spence Jr. is fighting and I think I’m the co-main event. It’s a real good card for me to get exposure and, yeah, I’m pretty excited. I’m happy back home and let’s give people what they want to see. IA: What are your thoughts on Moises Flores as an opponent for you on June 16th? DR: He fought Rigondeaux in his last fight and something happened in the first round. I don’t know if he got hit when the bell rang or something like that, but he’s undefeated. It’ll be a great fight. He’s taller than me, but I’ve been fighting this past two-three fights with taller guys than me and that’s helped me to fight taller people. He comes forward, he’s a Mexican fighter and I know Mexican fighters go out there and give it all. I know it’s going to be a great fight. I know he’s going to come in with everything because, not that long ago, I was the challenger too. I went in with everything, so I know he’s going to come at me with everything. IA: Was a fight with Rigondeaux and yourself ever talked about when you both held WBA titles? DR: Yes, and I was like, you know what, I’m here already and I want to fight the best. I know Rigondeaux is one of the best and sooner or later I’ll have to meet him. I’m ready to fight anybody. That’s what I get ready for. IA: Has there been any talk of unifying with Rey Vargas, Isaac Dogboe or Ryosuke Iwasa? DR: Yes, in my last fight, I called them out after my fight. I would like to unify. Hopefully everything goes great on June 16th and after that, hopefully we can unify with either of the champions, anybody that’s willing to accept the challenge. IA: What were your thoughts on Isaac Dogboe taking the WBO title from Jessie Magdaleno? DR: Oh, it was a good fight. Isaac Dogboe is a tough guy and comes to fight. Jessie, I think, was going to box a little bit more, but I guess it wasn’t his night. That’s another great champion, too. Dogboe will be a great challenge for me too. IA: Finally, what can fans expect from you on June 16th? DR: Expect a good fight. I’ll go out there and do my job. I’ll give people the fight they want to see and if it goes the distance or not, we’re ready for anything. Undefeated welterweight champion Errol “The Truth” Spence Jr. will defend his IBF world title in a Dallas-area homecoming at the Dallas Cowboys facility against unbeaten mandatory challenger Carlos Ocampo in the main event. It will be the first boxing event inside Ford Center and Spence’s first hometown fight as world champion.